We might’ve all heard how wonderfully beneficial carrots are for people. But, can dogs eat carrots, too? We, humans, definitely gain a whole bunch of goodness from this vegetable. As kids, we listened to our parents say that munching on those bright orange sticks will improve our sight. Carrots can do much more than just that. They are full of nutrients, vitamins and minerals, all of which support and enhance our healthy balance. Carrots are an essential addition to a healthy diet. And while it’s all true for humans, the question whether it is ok also for our pets to eat is hanging in the air. Dogs’ organisms differ from our own. Their digestive systems operate in a different manner, too. Let’s have now a closer look at the subject of feeding carrots to dogs. Are carrots good for dogs? If not, then what are the drawbacks? And if yes, then what is the best way to prepare this snack? In the end, a detailed list of questions and answers will be provided. It will cover everything on the subject of dogs eating carrots in 8 clear points. In short, yes, they are very good for dogs. Like many other vegetables, carrots can make a great snack. You can give it to your furry companion instead of or together with their usual treat. Carrots are sticks, basically speaking, and everybody knows that dogs love sticks. Not only that the yellow stick looks good, but it is also useful in cleaning your dogs’ teeth. A raw carrot will successfully help to scrub off the plaque build-up. Another undeniable benefit of carrots for dogs is their vitamin content. Vitamin A, which is carrots are abounding with, is very good for your dog. It is, as in the case of most other vitamins, essential for maintaining a proper metabolism. It is a fat-soluble vitamin that is stored in the fat cells of your pet. Vitamin A supports healthy skin and coat. It also helps an animal to normal growth. When dogs eat carrots, they are improving their night vision, too. After being absorbed in the body, vitamin A is transformed into retinal. Retinal binds to certain proteins called opsins. These are the chemical footing of animal’s vision. 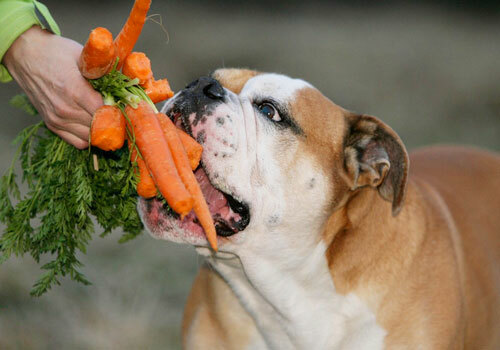 For overweight canine, a carrot is a great treat. It is low calories, fat-free and low on sugar. It is cheap too, making it a real home-made, low-cost treat anyone can afford to spoil their pets with. Important to mention also that the carrots fiber content will assist greatly in keeping your dog’s stools in order. Dogs that eat carrots will go regularly and probably won’t experience the trouble of constipation. If the situation is the other way around, carrots can also help bulking up loose stools. Add up a bit to the dog’s regular diet and raise the amount gradually. You will soon see improvement. Carrots are definitely good for dogs. It is, however, our duty as pet-parents, to know how much to give and in which way. The fact that carrots are good for your dog doesn’t mean that there isn’t a downside to eating them. Even a vegetable as great and beneficial as a carrot can harm a dog if too much of it is given. Some ways of eating might present more danger than others. Certain ways of preparing the snack can be safer for consumption. Why Are Carrots Bad for Dogs? Can dogs eat carrots and digest them? Thing is, it’s not all roses when it comes to dogs and carrots. Some will go as far as the other side of the spectrum. They will say that dogs shouldn’t be eating carrots at all. Well, because the dogs’ internal system is twin identical to that of the wolves. That, of course, means that their digestion is similar. And no one has ever heard of a wolf munching on a carrot. Rings true, but then… Wolves aren’t domesticated either. There are quite a few foods which fall under this category. And, while dogs aren’t built to digest these foods, it doesn’t really harm them either. Here it all comes down to the quantities given, and golden mean for the golden stick will serve the purpose. Carrots cells are surrounded by a cellulose barrier which is hard for the dogs to break. Due to that, they don’t actually ingest these vegetables. You may very well spot whole pieces of it in their poop. Feeding dogs large amounts of carrots may lead to problems. They might develop severe diarrhea and indigestion. If your pooch isn’t mad about this vegetable, it is not such a bad idea to steer away from it. 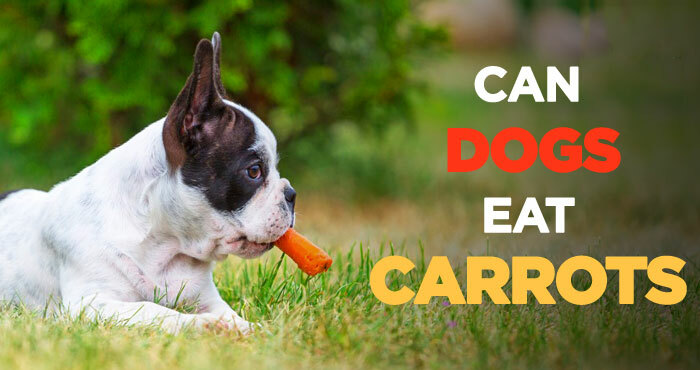 If your dog absolutely loves carrots, you don’t have to deprive him of his favorite snack. It is absolutely fine if you stick to no more than 2-3 baby carrots a day and monitor his stools closely. If you see that it all comes out as it is, give it a break. Since raw carrots for dogs are a tough nut to break, you can ease the digestion by steaming. Steaming is an excellent way to have the vegetable cooked yet still having all the nutrients in. Steam it for about 4-7 minutes, only to break the hardness. It will ease the feeding process and keep in the crunchiness. When feeding your dog a carrot, don’t add any sugars. Diabetic dogs may do well to avoid eating carrots altogether. Juicing, although may sound good, isn’t really that great. It keeps all the sugars but does what processed food does best: destroying important vitamins and minerals. These days, dogs’ diet together with their human counterparts’ is already way too processed. How to Prepare Carrots for Dogs? 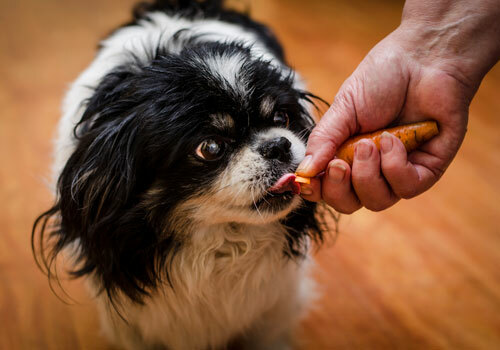 If you know for sure that your pooch loves carrots, go for it. Tried and tested is best. If you know that he eats them well in a raw form, you’ll do well cutting the veg into small bits. Although the dog would definitely enjoy munching on the bigger stick, it might present a danger. Besides the mess around, there is a risk of choking. If it is a first time you’d be giving your pet this treat, you can cook it for 10 min. or steam for 5. Slice it up nicely and serve when not hot anymore. Since carrots are doing well helping stomach problems, even their juice might help. If juicing, don’t add any sugar, carrots are a sweet veg already. Try to buy organic and wash it well. Even when buying organic these days, many times the vegetables aren’t what they used to be. They are deprived of vitamins and minerals because of the state of the soil. So, when preparing carrots for your dog, you have a few options. Juiced, cooked, steamed (keeps in all the essentials), boiled and raw. Make sure to cut the veg into chewable pieces to avoid choking. It is particularly important for smaller dogs. Pups that have problems chewing and sensitive gums will enjoy mashed carrots. You can add some leafy green to it making it into a real healthy meal. My Dog Ate Too Many Carrots! What Do I Do? When talking carrots for dogs, it is important to remember that they can’t digest it. If you see whole chunks of the vegetable in there, and your dog looks like he’s suffering from gastrointestinal discomfort, then perhaps he’s eaten too much. As all animals do, also dogs have natural instinct telling them how much of something they need to eat. While this is true, they don’t have the capacity to force themselves to stop eating something, because they know they shouldn’t. 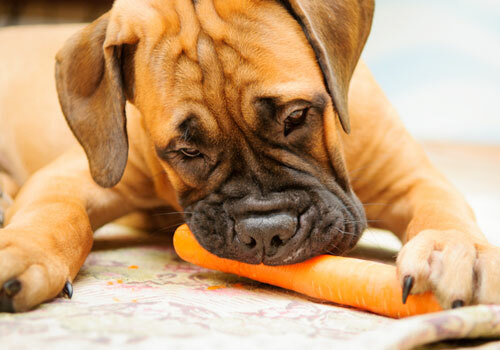 Dogs with indigestion or diabetes shouldn’t eat as much carrot as dogs without these problems. If happened and your pooch has dug somehow into the veggie basket and pulled out a bunch of carrots, eating it all in one go, you know you’re in for trouble. Since carrots are natural and aren’t a medicine or such, the danger is mild. Of course, in the case of a diabetic dog, contact your vet immediately or check the blood sugar levels yourself if you can. In any case, it is always safe to have a chat to the vet, if you know that your dog has eaten too much of something. Dogs can usually take care of themselves. They can become sick on purpose by chewing on some garden grass. That will help them get over the little ‘too many carrots’ incident. And surely, after that make sure to keep carrots and dogs in two different corners. 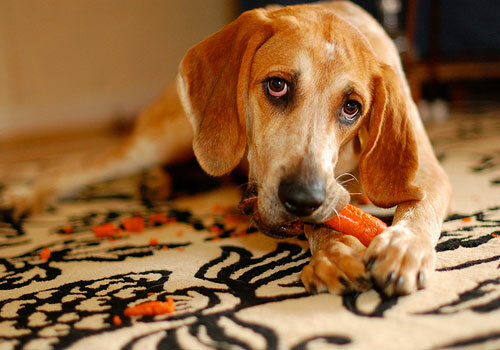 Many people out there are doubtful and unsure regarding dogs eating carrots. 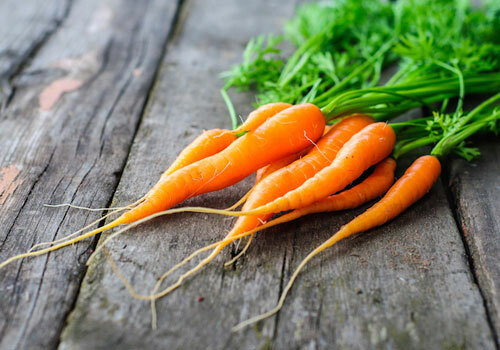 Here’re the eight most frequently asked questions touching the subject of carrots and dogs. Hopefully, after reading them, you will have a clearer understanding of the issue in hand. 1. Can dogs have carrots? Are carrots ok for dogs? The answer to that question is an absolute yes. Dogs can certainly have carrots. Carrots are ok for dogs. They are even more than just ok. They provide a beneficial supply of vitamins and minerals. These vegetables also influence dogs’ eyesight for the better. They help to clean their digestive tracts, too. 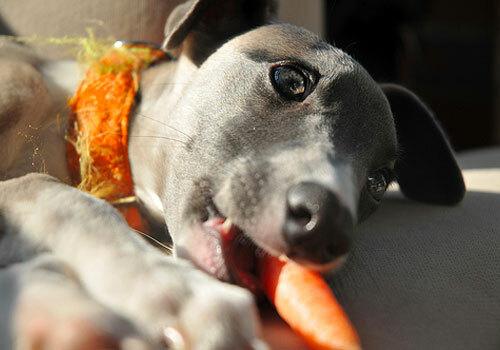 Besides that, carrots help cleanse dogs’ teeth, scraping off the plaque residue build-up. 2. Can dogs eat raw carrots? Are raw carrots good for dogs? Dogs can eat raw carrots. While the answer is yes, we should bear in mind that all the good stuff in carrots is locked behind cellulose. Dogs can’t break cellulose. Raw carrots are good fun for your dog to munch on. They also clean his teeth and provide him with a crunchy treat. It isn’t clear, however, how much nutritional benefit your pooch is actually getting from it. If in small amounts, it is definitely not bad. 3. Can dogs eat cooked carrots? They surely can. Cooked carrots as well as boiled or steamed can be actually a very good solution for dogs who find it hard to gnaw or digest raw ones. Cooking it for 10 minutes or steaming for about 5 will take the sternness away, allowing the pooch to enjoy the sweet veggie flesh. Cutting it into small pieces is important for preventing choking. It is true for small dogs in particular. 4. How many carrots can a dog eat without getting sick? And how often? It is personal really. Different dogs have different digestive capacities, as do humans. It is, however, recommended to feed your dog no more than 2-3 baby carrots per day. This can be repeated every day. That is, of course, if your dog really loves carrots or needs them for that reason or another. While he’s on a carrots diet, make sure to monitor his stools. 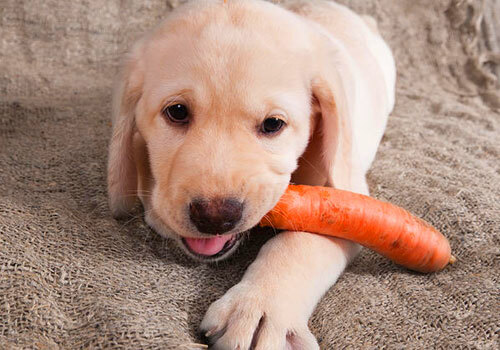 If a dog is sensitive to carrots, he might get sick from eating even just one. That is your indicator to avoid giving him this veg altogether. 5. Can carrots cause diarrhea in dogs? Dogs can certainly develop diarrhea from eating carrots. That will happen in the case of incompatibility or from having eaten too much of it. It might be just diarrhea or together with intestinal inflammation. If the case is severe, make sure to give plenty of water and visit a veterinarian. It is always best buying organic, non-GMO carrots to reduce the risk of a dog responding in such a reaction. Healthier food triggers healthier body response. 6. Can dogs eat baby carrots? Are baby carrots bad? Baby carrots are absolutely fine for your dog to eat. You have to be careful with them, though. It is crucial not to get misled by the size, thinking that since they are smaller more can be given. Firstly, we’re talking 2-3 baby carrots per day, which is fine for your dog to have. Secondly, still, cut them up. Baby carrot’s size presents a real choking hazard since it is small enough to put fully in the mouth and too big to swallow. 7. Can puppies eat carrots? Puppies can certainly have carrots. If you want to feed you little pooch a carrot, you can cook, steam or boil it. Mashing will make it into a nice comforting meal. If not mashed, cut into small pieces, taking into consideration that your pup’s esophagus and stomach are small. You will do well grating the carrots. It will make it really easy and enjoyable for your little one to munch on. 8. Can puppies eat raw carrots? Raw carrots are fine for puppies. Pups will have a great time gnawing that orange bone-like veg. A baby carrot for a baby-dog is a real treat. It will give the dog something to chew on, tasty and healthy at the same time. Watch your pup closely, though, while he enjoys his treat. See that he doesn’t swallow the whole thing. Probability is he will only nibble on it spitting the bits and making a huge mess. Still, don’t give too much. Firstly, yes they definitely can. Mature dogs, as well as puppies, can enjoy this healthy snack. Practicing the middle way is important. 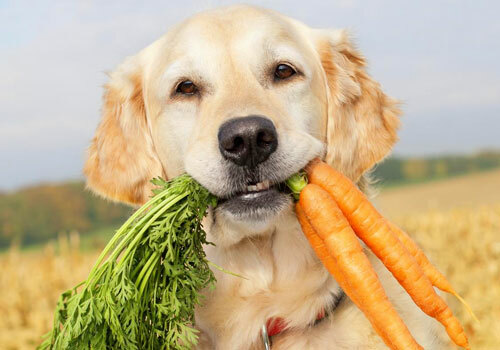 As healthy as they are, carrots aren’t digested well by canines. That will result in you possibly seeing bits of it coming out of the rear end and looking identical to how they came in. 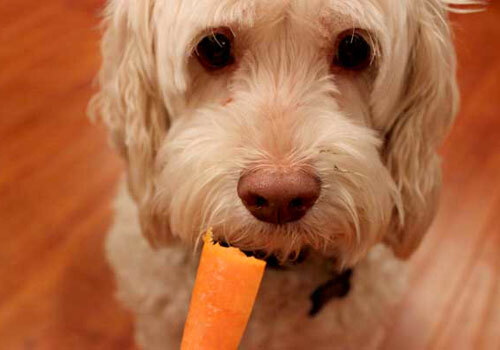 To ease up on your pooch, you can juice, cook, boil or steam the carrot. When juicing, watch out that don’t give too much of it, especially if your dog has diabetes. When giving the carrots raw, remember that there is a choking hazard. 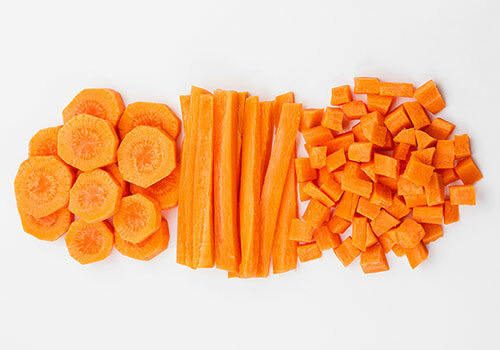 Cut the carrots into small bits and monitor your pet closely. What about dehydrated carrots for dogs? Is there an issue when they rehydrate inside their body? If you want to feed your dog dehydrated carrot once in a while, then it should be fine, but regular feeding is not recommended. Your dog can get diarrhea especially if he eats a large amount. Also, dehydrated fruits and vegetables lose nutrition in the process, and generally these are added to commercial dog foods as a filler or supplement.